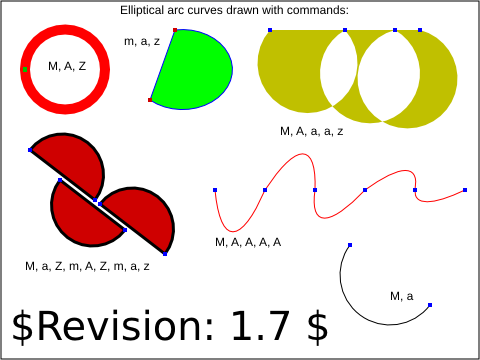 Test that the viewer has the basic capability to handle the 'path' element and its data (d) attribute in combination with the elliptical arc curveto commands, A, a (plus Mm and Zz). There are 6 subtests, each composed from the elliptical arc path commands per the label by the subtest. 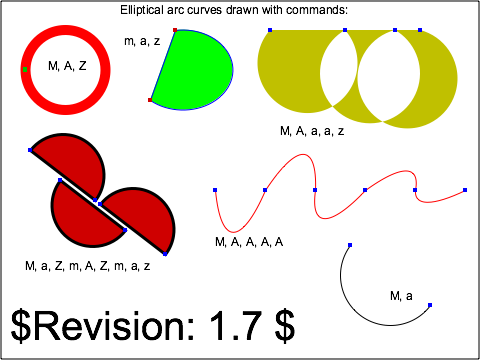 The curve positions are marked by small colored squares. Subtests are filled, or stroked, or both, using simple style properties and colors. The test uses the 'rect' element, as well as basic fill (solid primary colors), stroke (primary color wide and 1-pixel lines), font-family (Arial) and font-size properties.